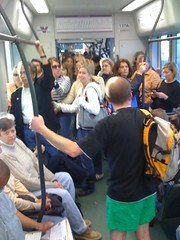 Break out your fanciest underpants – 2013 No Pants Light Rail Ride is coming! The 5th Annual No Pants Light Rail Ride is coming up on Sunday, January 13th. This event is part of the International No Pants Subway Ride started by Improv Everywhere. On this day, tens of thousands of people will be riding their public transportation without their pants. We expected hundreds of people to participate in the Phoenix ride. It’s going to be a ton of fun – we hope you can join us. 1) Be willing ride the light rail without your pants. 2) Be able to keep a straight face about it. Where: Three starting points along the Light Rail – details below. Bring: A backpack/bag and a Light Rail pass. You can wear almost any type of underwear you want – except thongs or g-strings. If you’re going to wear boxers we encourage you to wear briefs underneath them in case your fly separates. Take your pants off on the light rail platform or before you get there. If you’re worried you will be cold on the platform, you can take off your pants on the train, just be aware that’s a little bit trickier and more crowded. If you are wearing your pants to the event, bring a bag or purse to carry them once you de-pants. We will be starting at 3 locations this year. Notice that 2 of the groups will be changing trains before arriving at our final destination. If you want to really surprise the greatest number of people, start at one of those stations. Each group will board the first train that leaves their station at or after 1:00pm. We will have captains for each group (identified by a red scarf tied to themselves or their bag) that will help direct you. Plan to arrive early to purchase a light rail pass ($3.50 for round trip) and get last-minute instructions from your group captains. There are park and rides at each starting station. While you’re riding, act as if nothing strange is going on. Do what you’d normally do on the light rail – listen to your iPod, read a book, etc. You have no idea why others are not wearing pants. If anyone asks, have a simple excuse prepared for why you’re not wearing pants – you were hot, you forgot them, etc. Do NOT tell people you are doing a prank! We will have photographers on hand to take pictures documenting the event. We need everyone else to just act casually. If you bring a camera, be very discrete and only take a few pictures. It’s supposed to look like a normal train ride. Don’t disrupt the Light Rail! While the Phoenix Police Department said that wearing your underwear in public isn’t illegal, don’t do anything dumb. You are responsible for all your actions during this event. Once we arrive at the Roosevelt/Central station, we will be walk a few blocks to Angels Trumpet Ale House on 2nd St. All ages are welcome here. We’ll hang out, exchange stories, have a beverage, and take pictures before heading back from whence we came. We expect to be done at Angel’s Trumpet around 3:30pm. If you don’t want to stop at Angels Trumpet Ale House you can just take the train back when everyone else gets off, and you’re welcome to leave earlier if you need to. We look forward to seeing you on January 13th! Please RSVP on our Facebook event page so we know how many people to expect. Feel free to share this event so all your friends can join us too! If you have any question, post them on the event page wall. This is a fun event and we hope you can join us. The video from the 2012 No Pants Light Rail Ride is on YouTube and there are over 400 pictures on Flickr from last year’s event. Bonus: Help needed with video! We could use help from people who have video cameras and know how to use them. Extra points if you do video editing. If you would like to get involved, and can help us make some great video documentation of this (or any) flash mob, drop us an email! No Pants Light Rail Ride – Start 2012 in style! Don’t miss future pants or pantsless events – join our email list! Drop your pants and get on board! You are hereby invited to participate in the 4th Annual No Pants Light Rail Ride in Phoenix. This is part of The No Pants Subway Ride, which is a global event started by Improv Everywhere in New York in 2002. If you’re not in Phoenix, here is a list of global cities participating in the No Pants Ride. The event will take place at 1:00pm on Sunday, January 8th. Everything you need to know is in this post. Please read it carefully! 1) Willing to take pants off on light rail. Where: There are two starting points – choose whichever one is closest to you. There is a map of stop locations here. Be on time! Be at the West Side or East Side starting point station and ready to board the train at 1:00pm sharp. It is the same time for both stops. Be early if you need to, especially if you need to buy a light rail pass. Watch for Team Leaders (identified by a red bandana tied to their bag): The Team Leaders may try to split people into small groups to board different trains, depending how many people show up. Show up in your underwear! We’re not waiting to depants on the train. If you’re depantsing once you arrive, bring a backpack, briefcase, or something else to carry them in. You are responsible for your own pants. You can wear fun underwear if you like, but nothing that screams out, “I wore this because I’m doing a silly stunt.” Wear two pairs of underwear if it makes you feel more comfortable. Don’t wear a thong or anything else that might offend people. Our aim is to make people laugh, not piss them off. Buy a fare card! Show up early if you need to. Details on how to buy a card. Act normal – Stay with your group. Sit in the car like you normally would. Read a magazine, listen to your iPod, etc. You do not know any of the other pantless riders. If questioned, tell folks that you “forgot to wear pants” and yes you are “a little cold.” Insist that it is a coincidence that others also forgot their pants. Be nice and friendly and normal. Do not tell people you are doing a prank! You don’t really notice anything odd about people not wearing pants. Don’t disrupt the Light Rail – While the Phoenix Police Department said that wearing your underwear in public isn’t illegal, don’t do anything dumb. You are responsible for all your actions during this event. Last year was a lot of fun, and we’re anticipating tons of people showing up for the 2012 ride! Spread the word and tell your friends, just make sure they read all the rules! No Pants Light Rail Ride 2011 – Everything you need but the underwear! Here are the details on the 2011 No Pants Light Rail Ride, taking place this Sunday in sunny Phoenix, Arizona! This is part of The No Pants Subway Ride, which is a global event started by Improv Everywhere in New York in 2002. The event will take place at 2:00pm on Sunday, January 9th. Everything you need to know is in this post. Please read it carefully! Be at the West Side or East Side starting point station and ready to board the train at 2:00pm sharp. It is the same time for both stops. Be early if you need to, especially if you need to buy a light rail pass. Show up in your underwear! Unlike in the past, we’re not waiting to depants on the train. If you’re depantsing once you arrive, bring a backpack, briefcase, or something else to carry them in. You are responsible for your own pants. We will have photographers on hand to take pictures documenting the event. We need everyone else to just act casual. If you bring a camera, be very discrete and only take a few. It’s supposed to look like a normal train ride. Don’t disrupt the Light Rail – While the Phoenix Police Department said that wearing your underwear in public isn’t illegal, don’t do anything dumb. All responsibility for your actions during this event are entirely your own. Disembark at the Mill Ave station and head south. Stop by Starbuck’s for a coffee if you wish, but eventually make your way down Mill to 6th Street and hang a right. Head into Robbie Fox’s Pub where they will have some space set aside for us. At 4:00 start heading back to your Return stations. Try to stay with your group, but if you need to leave earlier (or want to stay later) that’s entirely up to you. The same rules apply as above. 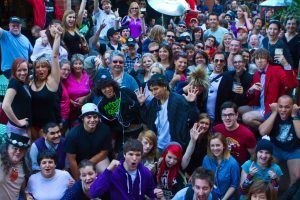 Last year was a lot of fun and we’re anticipating more people in 2011! Spread the word and tell your friends, just make sure they read all the rules! UPDATE: Added a mid-town start location at Central & Roosevelt!